What role do elastics (rubber bands) play in orthodontics? Wearing orthodontic braces may be the best choice for correcting your teeth and improving your smile, and that’s why you’ve come to see Dr. Rajasekaran at Liberty Orthodontic Centre. Braces, which consist of brackets and wires, work by gently applying pressure to the teeth, and that pressure causes them to move into the correct position. In some cases elastics, or rubber bands, are used to apply additional pressure needed to move your teeth. Customized for each patient, the rubber bands typically stretch over tiny loops on the top and bottom brackets. If worn consistently, and every day, these tiny elastics will apply the steady pressure needed to guide your teeth into the correct position. These elastics are crafted from medical-grade latex, which is safe to be in contact with your mouth. It’s common to remove the elastics during meals if opening your mouth wide enough to eat is difficult. Our staff will demonstrate how to affix the elastics so it will soon become second nature to replace them. DO – Get in the habit of carrying around extra rubber bands and replace them as soon as one breaks. 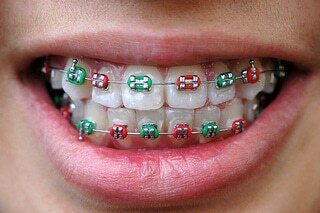 By consistently wearing the elastics, you may shorten the overall time needed to wear braces. DON’T – Double up on elastics as this will cause too much pressure on the tooth or teeth and can actually harm the root of the tooth. DO – Always wash your hands before removing or replacing the rubber bands. DON’T – Overstretch the rubber band or it will lose its strength and it will be ineffective. DO – Call us if you run out of rubber bands. DO – Have fun with your braces and elastics. There are many different colors available that can let you show off your soon-to-be perfect smile. Rubber bands are a key part of your orthodontic treatment, and learning how to remove and replace them is an important part to maintaining your braces. Before we set you on your journey to a perfect smile, we’ll make sure you understand all there is to know about how to take care of your braces. Of course, if you have any questions about your orthodontic treatment, or orthodontics in general, be sure to contact our Markham, ON office, and our staff will be happy to assist you!